with registered dietitian, Julie Rothenberg MS, RD, LDN – owner of JuliENERGYnutriton. The purpose of this course is to teach pre college and college age students (ages 15 – 25) about nutrition, how to have “nutrition independence” and how to foster a healthy relationship with food and your body. · and much more to come. By taking this course you will also gain access to recipes, infographics, body positive affirmations, mindful eating meditations and access to a VIP Facebook group to join the GraduEAT community. Julie Rothenberg, owner of local nutrition private practice, JuliENERGYnutrition, is a registered dietitian with a passion for honoring the body with nutrition and mindful eating. She believes it is important to teach students "what" and "how" to eat so they can be successful when they are out on their own. Julie has a mission to prevent troubled food relationships and to promote nutrition independence in young adults. 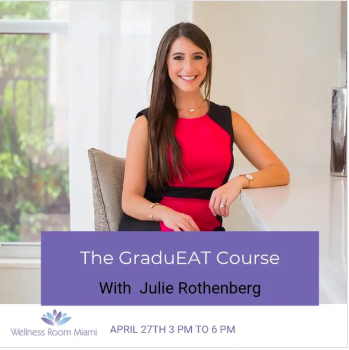 In addition to being a Registered Dietitian, Julie is also a Certified Intuitive Eating Counselor, and is committed to showing the GraduEAT Course students how to enjoy the pleasures of eating while instilling a confidence around and knowledge about food and nutrition. This is in no way whatsoever, a weight loss program. The GraduEAT Course is a weight inclusive course designed to educate about food and how to eat it!